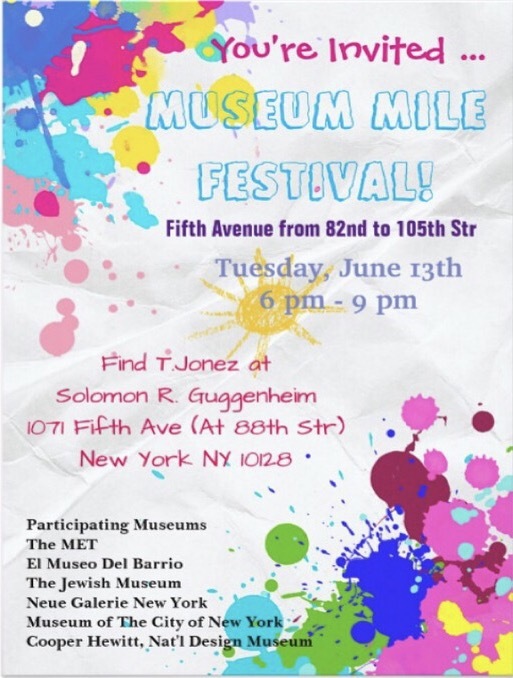 Museum Mile Fest – Jonez, Where We Going? I’m always in the mood for a festival, the icing on top is free access to Seven Museums?! Most Museums in New York City have a suggested fee for entrance, however most folks don’t know that, so they end up paying full price! Well not this gal! My favorite museum in New York is The MET! I am fully obsessed, and like most museum I can, and usually spend all day there. There’s so much to see, and resee! (Word?) During the festival, I do think I am going to focus all my attention on the Guggenheim! I’ve been there exactly once and that was years ago with my mother. If I’m not mistaken she had a school assignment, so naturally I tagged along. To this day, the magic of the Guggenheim still blows me away, and I cannot wait to refresh my memory with its beauty! I will try to make an effort to visit at least one other museum but I highly doubt I’ll be able to pull myself away from the Guggenheim. I will try to dance in the street, or decorate the sidewalk with chalk! If you are in the New York City area, please do partake in the festivities! SideNote: Its forecasted to rain but the rain doesn’t stop a thang, just bring your rainboots and umbrella, I’ll see you there!